My dear countrymen, Namaskar. We human beings have a natural inclination to be enchanted by the delights of the rainy season. Animals, birds, flora – nature in its entirety, is filled with the joys of the season. But sometimes, when the rain unleashes full force of its fury, we come to realise the extent of the destructive might of water. Mother Nature gives us life and nurtures us, but at times natural catastrophes such as floods and earthquakes wreak havoc on a massive scale. Climate change, altered weather cycles, and transformations in the environment, are also having a big negative impact. Recently, in certain parts of India, particularly, Assam, North-East, Gujarat, Rajasthan and some areas of Bengal, have had to bear the brunt of natural disasters, caused by excessive rains. Flood affected areas are being closely monitored. Relief efforts have been undertaken on an extensive cale. Wherever possible, my colleagues in the Council of Ministers are also personally visiting affected areas. The state governments too are making maximum possible efforts on their part to provide relief to the flood affected people. Social organisations, cultural organizations and common citizens charged with the spirit of service are also making their utmost efforts to help the affected people in this situation. The Government of India, Army personnel, Air Force personnel, NDRF personnel, Paramilitary forces – everybody does his or her best in providing succour to the disaster stricken people. Life goes completely topsy-turvy as a result of the floods. Crops, livestock, infrastructure, roads, electricity, communication links – everything gets affected. In particular, our Farmer brethren have to bear a lot of losses because of the damage to their crops and fields. Therefore, we have formulated a scheme for the insurance companies, especially crop insurance companies, to make them more proactive, to ensure quick settlements of claims for farmers. A 24x7 control room helpline number 1078 is functioning continuously to deal with the flood situation. People are also voicing their difficulties. Before the monsoons, the entire government machinery was brought into a state of preparedness through mock drills undertaken at most of the places. NDRF teams were deployed. Aapada Mitra, or Friends during Disaster were identified at various places and these were then trained in the Do’s and Don’ts; volunteers were enlisted, and a people’s organisation set up to work in this situation. Weather forecasts are available these days and the concerned technology has become so advanced these days, and space science also plays a very big role, that these weather forecasts turn out to be mostly accurate now. We should also gradually make it our nature to set our work patterns according to the weather predictions, which could safeguard us against losses. It has been one month since GST was implemented and its benefits can be seen already. I feel very happy and satisfied when a poor person writes to say how because of GST prices of various items essential for him have come down, and commodities have become cheaper. When a person from the North-East, someone living in the remote areas, in the hills or forests, writes a letter to communicate that in the beginning, he used to be apprehensive about GST wondering what it was all about, but now that he has begun to understand it, he feels that things have become much easier than before. Doing business has become so much easier. And most important of all, the trust of customers for the traders is increasing. I have been observing how GST has impacted the transport and logistics sector; how the movement of trucks has increased. The time required to cover distances has come down drastically. Highways have become clutter-free. Pollution levels have come down with the increased speeds of the trucks. Goods are also being transported much faster. This indeed is a convenience, but at the same time it is also bolstering the economic progress. Earlier, because of the multiple tax structures, maximum resources of the transport and logistics sector were expended in maintaining paperwork and that also led to the need for construction of new warehouses in each state. I call GST, Good and Simple Tax. Indeed, it has produced a big positive effect on our economy in a very short time span. The speed at which the smooth transition has taken place, along with rapid migration and new registrations, has instilled a new sense of confidence in the entire country. And some day, the Pundits of Economics, Pundits of Management and Pundits of Technology, will certainly undertake researches and write about India’s GST experiment as a model for the world. It will become a case study for universities across the world. The implementation and furtherance of such a phenomenal change on such a monumental scale, with the involvement of so many tens of millions of people in such a vast country, is in itself a pinnacle of success. The world will definitely make a study of it. And this implementation has had all the states participating in it and sharing the responsibility. All decisions have been taken unanimously by the states and the Centre together. And as a result, one overriding priority for every government has been to ensure that there is no burden on the plate of the poor on account of GST. And using the GST App all information is available on your mobile phone as to how much the price of an item was earlier and how much will it be now in the new situation. The lofty dream of One Nation – One Tax has finally been fulfilled. In the matter of GST I have seen how everyone, right from the Government functionaries at the Tehsil level to the officers in the top echelons of Government of India have toiled tirelessly with great dedication. The manner in which the friendly environment was created between the Government and traders, between the government and consumers, played a very significant role in enhancing mutual trust. I extend my heartiest felicitations to each and every ministry, every department and all employees of the Central and State governments involved with this process. GST is a fine example of the collective strength of the people of India. This is a historic achievement. And this is not just a tax reform; it is a new economic order that will strengthen a new culture of honesty. In a way, it is also a campaign for social reformation. I would like to once again express my deep gratitude to the millions of my countrymen who have contributed to the successful achievement of this great feat with such felicity. My dear countrymen, the month of August is the month of Revolution. We have been hearing this as a natural fact right from our childhood and the reason is, the Non-Cooperation Movement was launched on the 1st of August 1920; the Quit India Movement, which is also known as ‘Agast Kranti’ began on the 9th of August 1942; and on 15thAugust 1947 India became independent. In a way, there are many events in the month of August that are closely associated with the history of our freedom movement. This year, we are going to observe the 75th Anniversary of the Quit India Movement. But very few people know the fact that the slogan, ‘Quit India’ was coined by Dr. Yusuf Meher Ali. Our young generation must know what had happened on the 9th of August 1942. From 1857 to 1942, the people of India, with their ardent desire for freedom, came together, fought together, and suffered hardships; these pages of history are an inspiration to us for building a glorious India. The heroes of our freedom struggle with their single-minded devotion did a ‘Tapasya’, endured hardships, made great sacrifices and even laid down their lives; what greater inspiration could there be! The ‘Quit India Movement’ was an important milestone in the Indian Freedom Movement. It was this movement that had made the entire nation determined to attain freedom from the British Rule. This was the time when the people of India, in every part of the country – be it a village or city, the educated or illiterate, the rich or poor, everyone came together shoulder to shoulder and became a part of the ‘Quit India Movement.’ People’s anger was at its peak. Millions of Indians responded to Mahatma Gandhi’s clarion call and the mantra of ‘Do or Die’; they flung themselves into the struggle. Millions of the youth of the country renounced their studies, gave up their books. They set out on the march to the sound of the bugle for freedom. Mahatma Gandhi gave a call for the ‘Quit India Movement’ on 9th August, but each and every prominent leader had been imprisoned by the British Government, and it was during this time that the second generation of leadership comprising great men like Dr. Lohia, Jaiprakash Narain played a leading and pivotal role. In the ‘Non-Cooperation Movement’ of 1920 and the ‘Quit India Movement’ of 1942, two different personas of Mahatma Gandhi can be seen. The whole scenario of the ‘Quit India Movement’ was different and in 1942 things rose to such a point, there was such a heightened sense of intensity, that a Mahapurush like Mahatma Gandhi gave the mantra of “Do or Die.” The reason for this entire success was the people’s support, people’s resolve, and people’s struggle. The entire country had come together as one to fight for the cause. And I sometimes think that if we link the pages of history, it is seen that the First War of Independence took place in 1857. The freedom struggle which began in 1857, continued to be manifested in one or the other corner of the country till 1942. This long time period ignited the intense longing for freedom in the hearts of the people. Each one became committed to do something. The determination did not diminish with each passing generation. New people kept coming forward each time in place of those who departed and the country kept on every moment endeavouring tirelessly to uproot the British Rule. This perseverance, this struggle from 1857 to 1942 created a situation which reached its climax in 1942; the clarion call of ‘Quit India’ was such that within five years, in 1947 the British were compelled to leave India. 1857 to 1942 – the yearning for freedom had reached the grassroots, had reached everybody. And 1942 to 1947 – these decisive five years became integral for the masses to successfully attain through resolve, freedom for the country. These five years were indeed decisive. If 1.25 billion Indians, commemorate Agast Kranti Day of 9th August, and each person resolves on 15th August, that he or she will do for the country, this much as an individual, as a citizen, this much as a family, this much as a society, this much as a village, this much as a city, this much as a government department, and this much as the government; let there be millions and millions of resolves; let there be strivings for the realisation of these millions and millions of resolves. Just as the five years from 1942 to 1947 were decisive for the country’s Independence, these five years from 2017 to 2022 can and must play a decisive role for the future of India. Five years from now, we will celebrate 75 years of India’s Independence. Therefore, we must take a firm resolve today. We must make 2017 our Year of Resolve. In this month of August, we have to come together and resolve: Filth - Quit India; Poverty – Quit India; Corruption – Quit India; Terrorism – Quit India; Casteism – Quit India; Communalism – Quit India! The need for today is not ‘Do or Die’, instead it is to resolve, to come together, persevere, and work relentlessly with our utmost strength towards the making of a new India. Let us live by and strive for this resolve. Come let’s launch a mega campaign Sankalp se Siddhi – Attainment through Resolve, from the 9th of this August. Every Indian, social organisations, Local Self-Government Institutions, schools, colleges, various organizations - all should take one resolve or the other for a New India. A resolve that we will positively fulfil in the next five years. Youth organisations, student organisations, NGOs, etc. can organise group discussions, to bring forth new ideas. Where do we want to reach as a nation? What can be my contribution for this as an individual? Let us come together and make this a Festival of Resolve. My countrymen, I would like to say one more thing to you. India's economy has in itself an element of social economics. And we should never underestimate its value. Our festivals, our celebrations are not merely occasions of joy and merriment. Our festivals are in themselves campaigns of social reform too. And each of our festivals are directly linked with the financial conditions of the poorest of the poor. Rakshabandhan, Janmashtami, Ganesh Utsav, Chauth Chandra, Anant Chaturdashi, Durga Pooja, Diwali - these will be observed one after the other. And this is also the time when the poor get an opportunity to earn an income and of course this adds a spontaneous joy to the festivities. Festivals lend a sweetness to our relationships, bring a warmth of togetherness in the family and foster brotherhood in society. They connect the individual with society. It is a natural journey from the self to the collective. And the ‘I’ gets an opportunity to transform into a ‘We’. As far as the economy is concerned, hundreds of families start making Rakhis in small household units, many months before the festival of Rakhi. A variety of Rakhis are made in a whole range of materials, from ‘khadi’ to silken threads. People prefer homemade Rakhis these days. Rakhi makers and their sellers, sweets shops vendors – the professions of hundreds, thousands flourish on the occasion of a festival. The households of our poor brethren and their families are dependent in a way on these activities. When we light a ‘diya’, an earthen lamp on Deepawali, it is not merely a festival of lights, a festival that illuminates the entire house; it is directly connected with those poor families who make small ‘diyas’ or earthen lamps. Today as I speak about festivals and how they are linked to the economy of the poor, I want to touch upon the subject of environment as well. I have observed and sometimes think that the citizens of our country are more aware and active than me. For the last one month, environmentally conscious citizens have constantly written letters to me. And they have requested that I talk about eco-friendly Ganesha idols, well in time for people to plan for clay Ganesha idols during the festival of Ganesh Chaturthi. Firstly, I am most grateful to such conscientious citizens. They have urged me to speak on this subject well before the festival of Ganesh Chaturthi. This time around, there is a special significance to the observance of community Ganesh festival as a public celebration. Lokmanya Tilak ji started this great tradition, and this year marks the 125th anniversary of community Ganesh festival. 125 years and 1.25 billion countrymen! Lokmanya Tilak ji started the Sarvjanik Ganeshotsav with the basic aim to inculcate the spirit of unity, enhance awareness in society, and promote the culture of togetherness. So this year we should again, during the Ganesh festival, organise essay competitions, have open discussions and remember the contributions of Lokmanya Tilak. And we must think anew ways to steer Community Ganesh Festivals in consonance with the sentiments of Tilak ji. How we must lend strength to that spirit and at the same time resolve to use eco-friendly clay Ganesha idols, to protect the environment. And this time I have spoken about it well in time. I am sure that all of you will join me. This will surely benefit our poor artisans, and artists, and provide employment to those who make idols. The poor will be able to earn a living and feed themselves. Come, let us link our festivities with the economic welfare of the poor, let the joys of our festivals connect with the households of the underprivileged, bringing monetary happiness to the have-nots. This should be the endeavor of all of us. I extend my best wishes to all my countrymen for the various upcoming festivals and celebrations. My dear countrymen, we are continually seeing that our daughters are bringing laurels to the country in all the fields – be it education, economic activities, social spheres or in sports - they are scaling new heights. We as a nation take great pride in our daughters. Recently our daughters performed brilliantly in the Women's Cricket World Cup. This week I had the opportunity to meet our daughters, the members of our Women's Cricket team. I felt happy talking to them, but I had a feeling that they felt burdened by the fact that they could not win the World Cup. This stress, this tension was evident on their faces also. So while speaking to these daughters, I put forth a different viewpoint before them. I said, “Look, this is the age of the media. So expectations get hyped up to such an extent that if corresponding success is not achieved, these turn into despair and even resentment. We have seen during many such events where if the Indian players fail, the anger of the country is vented towards the players. Some people cross all limits of decency and say and write things that inflict pain and hurt. But it happened for the first time that when our daughters did not succeed in winning the World Cup, the hundred and twenty-five million people took this defeat on their own shoulders, never letting the burden weigh down these daughters of ours. Not only this, they lauded them and showered them with high praise for their brilliant performance. I view this as a healthy and pleasant change and I told these daughters that only they were blessed with such good fortune, and hence they should banish any thought of not having been successful. You may not have won the final match but you have won the hearts of 1.25 billion Indians. Truly our young generation, especially the daughters of our country are doing so much to bring glory to the nation. I once again extend my heartiest congratulations and best wishes to the young generation of our country, especially our daughters. 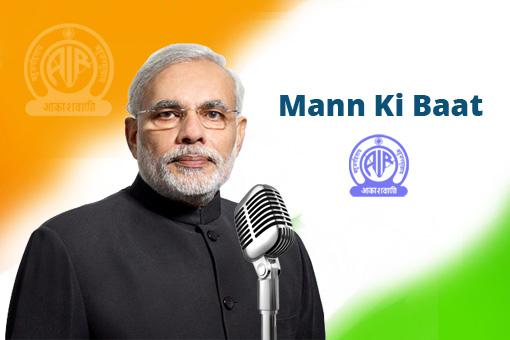 English rendering of the text of PM’s ‘Mann ki Baat’ programme on All India Radio on 30.07.2017, The Government of India, Army personnel, Air Force personnel, NDRF personnel, Paramilitary forces – everybody does his or her best in providing succour to the disaster stricken people. Life goes completely topsy-turvy as a result of the floods.